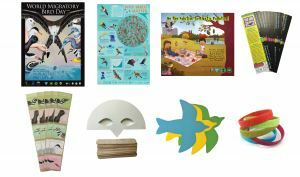 Each year, Environment for the Americas provides World Migratory Bird Day materials to groups in need. We have developed two “kits” in different sizes. Our small kit provides materials for groups of 50, and our large kit will accommodate groups up to 100 participants. We try to help as many groups as possible!